The qualification firing tables for the DGT include Firing Tables 7 and 8.
a. Firing Table 7. Soldier practices firing the DGT. This table is for practice qualification only. It evaluates the gunner's ability to engage stationary and moving targets using both the daysight and nightsight. Some targets are more difficult to hit than others. TASK Engage stationary, moving, and multiple targets. CONDITIONS Given a DGT, DGT disk number 14, LCE, a protective mask, and helmet. STANDARD Kill 16 out of 20 target vehicles. b. Firing Table 8. This table is for qualification. It evaluates the gunner's ability to engage stationary and moving targets using both the daysight and nightsight. Some targets are more difficult to hit than others. TASK Engage stationary, moving, and multiple targets to qualify. CONDITIONS Given a DGT, DGT disk number 15, LCE, protective mask, and helmet. c. Scorecard. 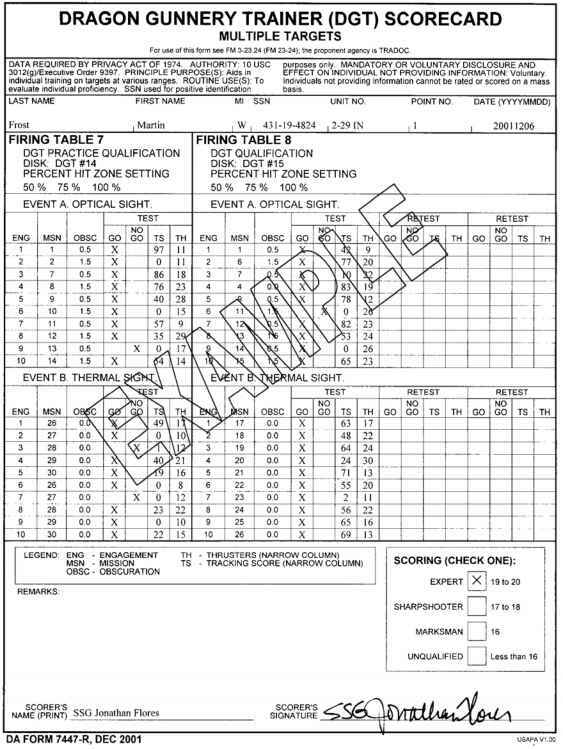 Use DA Form 7447-R, Dragon Gunnery Trainer (DGT) Scorecard, Multiple Targets, to score Firing Tables 7 and 8. (1) This blank, reproducible form may be copied from the back of this manual onto 8 1/2 by 11-inch paper. 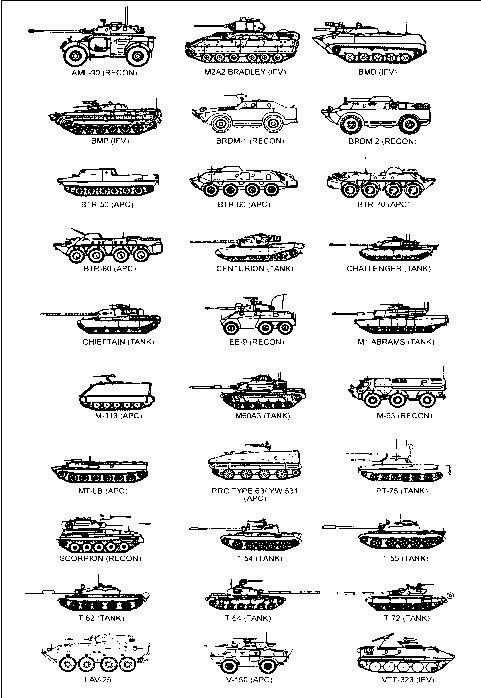 It is also available on the Army Electronic Library (AEL) CD-ROM (EM0001) and at the USAPA website located at (http://www.usapa.army.mil). (a) ENG. Engagement number is preprinted on the scorecard. (b) MSN. Mission number is preprinted on the scorecard. (c) OBSC. Level of obscuration is preprinted on the scorecard. (d) TEST. The soldier must score at least 16 in order to qualify on the Dragon. He gets three chances to do so. If the soldier misses 5 engagements, he will not be able to hit the required sixteen targets. He must move on to the first retest, which another scorer oversees. — GO. Check in this column if student scores a hit. — NO GO. Check in this column if student misses. (e) RETEST (1). The same conditions apply to this test. If the soldier again fails to hit sixteen targets, he moves on to his last retest. — GO. Check in this column if student scores a hit on the retested target. — NO GO. Check in this column if student misses the retested target. (f) RETEST (2). A third scorer oversees this test. If the soldier misses five (fails to hit sixteen) on this last test, he fails to qualify on the trainer. (g) TS. Enter tracking score. (g) TH. Enter number of thrusters fired. d. Scorecard. On the scoring scale shown to the left of the legend, mark the box next to the scoring category the soldier achieved. Figure D-1. 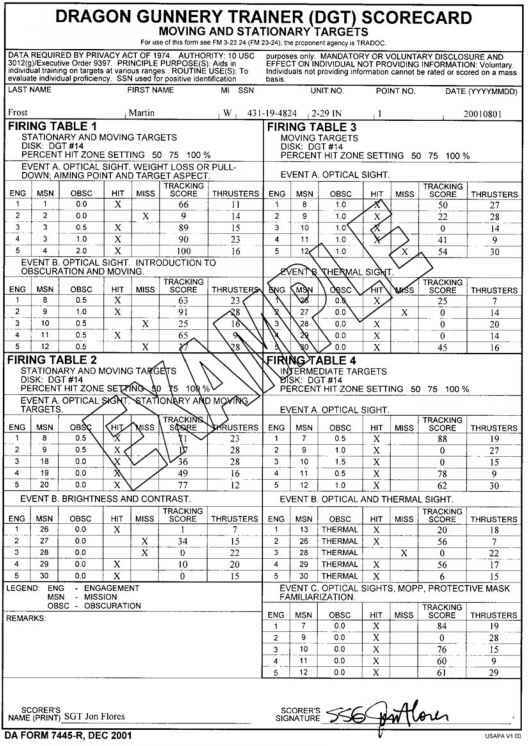 Example completed DA Form 7445-R, Dragon Gunnery Trainer (DGT) Scorecard (Moving and Stationary Targets), Firing Tables 1 through 4. Figure D-2. 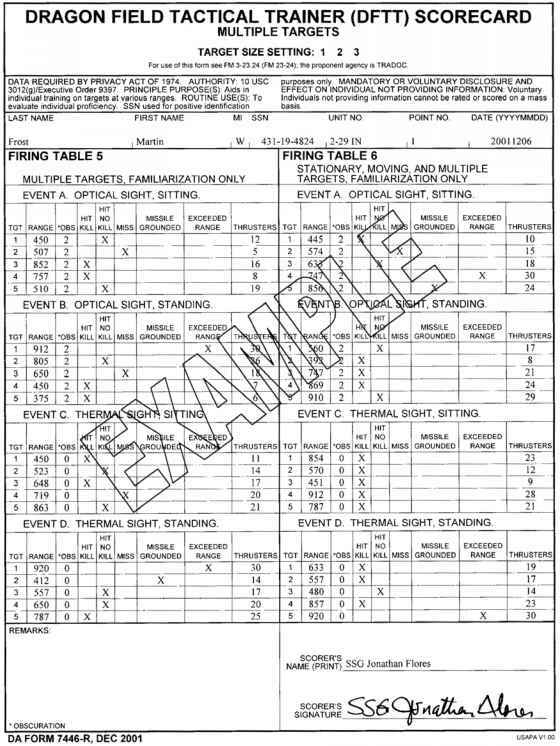 Example completed DA Form 7446-R, Dragon Field Tactical Trainer (DFTT) Scorecard (Multiple Targets), Firing Tables 5 and 6. Figure D-3. Example completed DA Form 7447-R, Dragon Gunnery Trainer (DGT) Scorecard (Multiple Targets), Firing Tables 7 and 8.